The ticker for the IG index is IBOXUMAE, and for the HY index is IBOXHYAE. Is there any reason why the IG index was so much higher pre-2013? Can I still use pre-2013 data or would that be problematic? The indices have different quoting conventions. 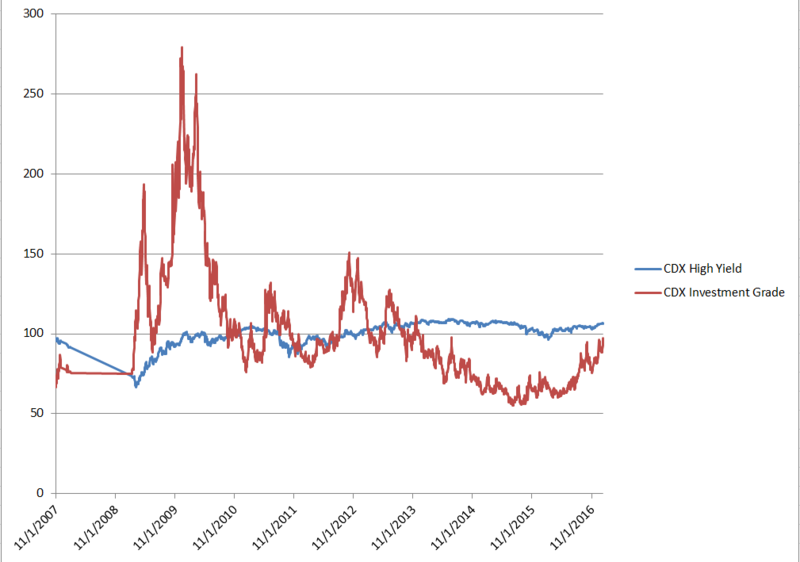 The way that a CDS index is traded is that you pay a fixed amount per year for protection in case of default (100 bps for IG, 500 bps for HY) and therefore the contract does not have a zero present value (as it would have if you paid the par spread, like in a fixed for floating interest rate swap). The amount you pay to enter the contract is the "upfront". If the fair spread is above the annual coupon, you will need to pay to enter the contract, i.e. the upfront is positive. If the fair spread is below the annual coupon, you will be paid to enter the contract, i.e. the upfront is negative. When you see a quote for CDX IG, you are seeing the fair spread being quoted. There is a model used to turn this into an upfront payment (the ISDA CDS Standard Model). 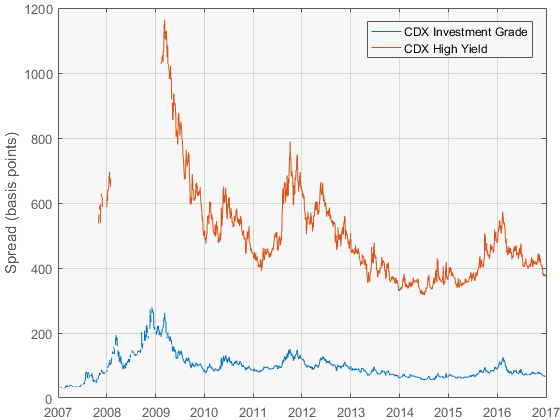 CDX HY is quoted directly as the upfront (or rather, it is quoted as 100 minus the upfront, since the upfront can be negative, and dealers want to avoid using negative prices). So when you see the CDX HY being quoted as 106, that means that the upfront is -6. Converting this to basis points gives -600. The coupon for CDX HY is 500 basis points, and the tenor is 5 years, so the spread is 500 + (-600)/5 = 380 basis points, i.e. buying protection on HY issues is cheap at the moment (relative to the CDS coupon). Not the answer you're looking for? Browse other questions tagged data cds indexes or ask your own question.